Want to know how to make eyelashes longer? Nowadays it seems all of the celebrities and models have glorious long and thick lashes. This trend towards feather-like eyelashes may come easy for some, but for many people genetics, hormones, age, nutritional deficiencies, or even an existing medical condition hinder growth. Whether you want to look like your favorite star or are simply looking for ways to plump eyelashes that have thinned over the years, we have the natural solutions to help. Continue reading to learn how to make your eyelashes look longer and thicker. From extensions to false eyelashes to thickening mascara, there are many products on the market to enhance the appearance of your eyelashes. Depending on the reaction of your natural eyelashes, these methods can weaken and even remove your lashes. 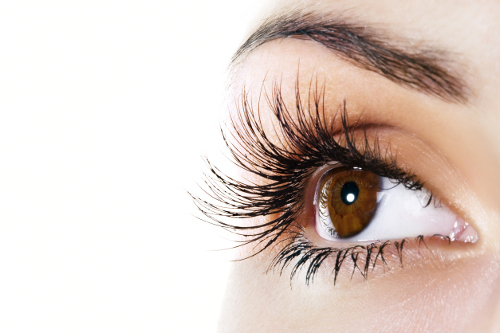 We have compiled a list of tips on how to grow eyelashes longer and thicker at home. The vitamins and minerals within aloe vera can help the eyelashes to grow and thicken while moisturizing. Use as an overnight treatment with applying on lashes with a cotton swab. Rinse well in the morning. Castor oil has long been used to cure many ailments, but did you know it contains nourishment for hair follicles? Apply a few drops of the oil to the eyelashes with a cotton swab before bedtime. Rinse in the morning. You can add a drop of aloe vera gel or olive oil to the castor oil as well. Repeat this every night for a few days to see results. Perhaps you have used olive oil to stimulate hair growth. It can also be used for longer and stronger eyelashes with its major component of vitamin E. Use a cotton swab to apply a few drops of olive oil directly on the lashes every night before bed. Rinse in the morning. The thought of lemon juice in the eyes may make you cringe, but this treatment involves the peel of the lemon and not the fresh juice. There are nutrients such as folic acid and vitamins C and B in the lemon peel, which could stimulate growth of lashes. Combine one tablespoon of dried lemon peel and olive oil or castor oil in a container. There should be enough oil to cover the peels. Leave in the container for two weeks before applying the solution to eyelashes with a cotton swab for overnight treatment. Rinse in the morning. Eggs may promote strength and length for eyelashes with the nutrients like biotin, protein, and B vitamins. Add one egg to one tablespoon of glycerine and beat together until creamy. Apply to lashes with a cotton swab and leave for 15 minutes before rinsing. Repeat three times each week. The flavonoids in green tea are another possible natural way to make your eyelashes grow. Steep a cup of unsweetened green tea with one teaspoon of green tea leaves. Cool and apply to eyelashes with a cotton swab. Rinse with cool water after 15 minutes. Add shine to your lashes as they grow thicker with the proteins and essential fats found in coconut milk. Use a cotton swab to dab coconut milk directly onto the lashes. Rinse after 10 minutes and repeat daily. The vitamins A and E in organic shea butter can help to stimulate healthy follicles while promoting growth. Put a small amount on your index finger and use your thumb to rub to a softer consistency. Dab on lashes for an overnight treatment. Rinse in morning. The use of products on our eyelashes can determine the length and strength of the lashes. How we care for our lashes can also make a difference in whether we have thin, scraggly wisps of hair or luscious, thick wings outlining our eyelids. It is essential to remove any eye makeup at the end of the day. We wash the dirt, grime, stress, and makeup off our face every night, so why not treat our lashes the same? Use a mild remover as well as slow, gentle strokes to avoid damaging or losing lashes. These delicate hairs are much finer than the hair on our head and take twice as long to grow. Just as the hair on our head needs to be trimmed, our eyelashes can benefit from a trim once every two to three months. Small, gentle cuts of one-quarter in length could encourage growth. Maintain a healthy diet to promote nourishment of hair follicles with essential vitamins and minerals. Consume fresh fruit such as strawberries, blueberries, cranberries, apples, guavas, and citrus fruits. Enjoy green leafy vegetables of kale, broccoli, Brussels sprouts, peas, cauliflower, collard greens, and tomatoes. Add proteins like lean meat, poultry, fish, eggs, milk, and cheese; and good fats such as sunflower seeds, almonds, avocadoes, and olive oil. Every morning and night, give your eyelashes a good cleaning by brushing away any particles. Use a soft eyelash brush with gentle strokes to stimulate circulation and deliver the healthy oils to all sections. It may seem like a strange treatment, but the follicles of the eyelashes can be boosted simply by massaging the eyelids. Use gentle strokes of the tips of your fingers. Many people enjoy using the fake eyelashes for special occasions, but these artificial extensions can damage your natural lashes. There is a high chance of pulling out your lashes upon removing the fake ones. While an eyelash curler is intended to create the look of longer lashers, it can actually damage the lash. This may cause the lash to fall out or break. Limit your use or avoid using the curler while growing lashes longer. Long, thick, luscious lashes are all the rage in recent years, and it seems the trend isn’t going anywhere anytime soon. To acquire full sets of eyelashes, you can try some of the home remedies, which may be more gentle than chemical treatments. Using false eyelash extensions and curling devices can potentially damage your natural lashes. By following a proper care routine and stimulating the hair follicles with natural remedies, you might soon enjoy big, attractive lashes. Be patient, though, as it could take weeks and even months for some people to see results. Kukreja, K., “9 Natural Remedies To Get Beautifully Long Eyelashes,” Style Craze, June 14, 2017; http://www.stylecraze.com/articles/grow-your-eye-lashes-long-and-healthy/#gref, last accessed June 19, 2017. “11 Tips And Home Remedies On How To Make Your Eyelashes Grow Longer and Thicker,” Beauty and Tips; http://www.beautyandtips.com/beauty-2/11-tips-and-home-remedies-on-how-to-make-your-eyelashes-grow-longer-and-thicker/, last accessed June 19, 2017. “Home Remedies to Grow Thicker And Longer Eyelashes,” Top 10 Home Remedies; http://www.top10homeremedies.com/home-remedies/home-remedies-to-grow-thicker-and-longer-eyelashes.html, last accessed June 19, 2017.